Tom Morello is the Nightwatchman. That is becoming more clear with each release. 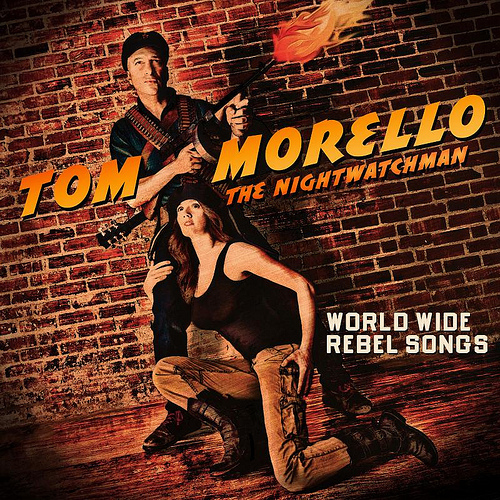 The Tom Morello name is now top billed over The Nightwatchman on World Wide Rebel Songs, the first record to do so. This is a record of changes for The Nightwatchman, it has a different sound from any other release. While Morello had System of a Down’s Serj Tankian on his last record The Fabled City, this time he went with Ben Harper to help him out to try to entice more listeners. The Harper duet “Save The Hammer For The Man” is a centerpiece for the album. The lead track “Black Spartacus Heart Attack Machine” is vintage Morello with its spirited vocals and upbeat tempo that builds to the chorus each time. The brooding “Facing Mount Kenya” shows Morello’s growth as a songwriter and as a vocalist. The title track “World Wide Rebel Songs” is Morello’s take on “Instant Karma” in many ways with its big sing along, repeated choruses and dreams of a better world. John Lennon’s message in “Instant Karma” may have been a little different but in the end Lennon and Morello envision a very similar world. The true gem of the record is when Morello lets loose with the electric guitar on “It Begins Tonight” it is the closest the Nightwatchman has come to sounding like Rage Against The Machine and the song is every bit as good. The record does tend to be a little uneven with the addition of electric guitar to the songs, it is used sparingly enough to hold the album together without seeming to be added on where it doesn’t fit. This entry was posted in 250 word album reviews and tagged Ben Harper, It Begins Tonight, Rage Against the Machine, Save the Hammer For the Man, The Nightwatchman, Tom Morello, World Wide Rebel Songs. Bookmark the permalink.